Below are instructions on how to changeover material from Open Cell (OC) to Closed Cell (CC) or from Closed Cell to Open Cell, using the Logan Manifold. Changeover only takes about 10 minutes, once the Logan Manifold is set up, and material waste is minimal at only eight ounces. SprayWorks frequently gets calls from contractors with issues related to transitioning their spray foam equipment from one B-side material to another. 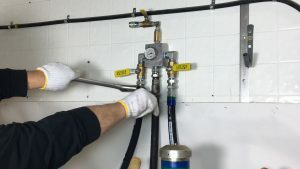 We recently decided to take action and launched a new product, the Logan Manifold, to help applicators easily transfer material from Open Cell to Closed Cell or from Closed Cell to Open Cell. Material is a costly investment in any project and can easily change your profit margin if you’re not careful. Time has been a learning experience and our experts prepared the top four ways to save material and prevent waste on the job site and in storage. 1. Balance the chemical ratio: When applying spray foam, it’s important to keep your chemical ratio accurate based on the material supplier’s specifications. Is your foam not sticking to the substrate? Is it fishy smelling? These are all signs your ratio is off, requiring a second application and wasting additional material. The fishy smell is a result of the foam being resin rich, requiring a decrease in the “A” side. When determining which type of polyurethane spray foam insulation to install, careful consideration should be placed on which type of cell is appropriate for the application. SprayWorks portable spray foam equipment is designed to accommodate both open cell and closed cell foam insulation.